The Lodge Maribaya is located at Jalan Maribaya No 149/252, District Lembang, West Bandung regency. Well then what is the charm of the attraction of the lodge maribaya so we must visit it? If anyone asks, is the money we paid for The Lodge Maribaya Lodge Entrance Fee comparable to what it will get? Of course, visiting Maribaya Lembang Tour is guarantee you will not regret, even one day will come back to this place. This tourist spot is actually quite popular as a place to see the natural beauty from the highland mountains in Lembang Bandung. Its location is at an altitude of 2,090 meters above sea level, with an area of ​​about 3 hectares more. Friends of the traveler's, in addition you can enjoy one of the natural attractions in the exotic and romantic west bandung also take pictures. Here also you can try the thrill of 6 new and old rides that have been provided by the manager for all visitors. Entry Ticket Price The Lodge Maribaya Lembang Bandung TerbaruThis is one of the interesting rides that currently exist in The Lodge Maribaya in the form of a unique tree house rides or Sky Tree. From the location of this Tree House we can see the natural beauty around the lodge Maribaya very clearly. Sightings proof of its beauty can you see many scattered on the internet, one of the media used is social media instagram. To get to the location of this Sky Tree visitors must rise first through the stairs made of wood. You do not have to worry when climbing on it, because the ladder is already tied to a strong security rope. Well your struggle to conquer these stairs will be paid when you have reached it, in the Tree House. Let go as far as the eyes can see the beautiful nature hammer there, and breathe in a cool and refreshing air. Do not forget, capture the moment with a self-portrait, therefore prepare your best camera. If you want a better picture, you can hire photographer services available there, quite cheap. If you are interested in feeling so exotic and romantic natural beauty from the top of this tree house, visitors must pay first. Entry Ticket Price to Sky Tree The Lodge Maribaya Lembang Bandung currently is Rp.15.000 / person once ride. 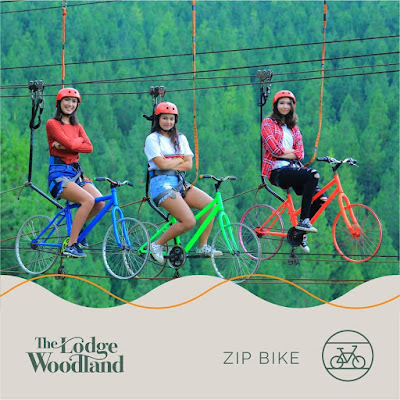 Zip Bike The Lodge Maribaya, did you ever try out the tourist attractions in the scared offering thrill test and challenge your adrenaline? The Zip Bike rides at The Maribaya Lodge are as the name implies is a bike ride that is hung with a safety rope in the Air. Is it safe to try this Zip Bike game? Very safe, because these game guides are professional people who will supervise and assist you. In addition to his bike that has been tied to the rope, you are also associated with a safety rope before riding it. This exciting and challenging moment should not miss you to document it. You can have your friend or spouse to take a photo while you are in action, or also record the video.Well to be able to enjoy the sensation of this Zip Bike rides every visitor is also charged separately. Currently Admission Rates Zip Bike rides The Lodge Maribaya is Rp.20.000 / person one way. This new vehicle was launched around 21 June 2017 ago, and immediately attracted the attention of visitors.This air balloon is tied with a rope with a height of 6 meters from the highest location there. Here you are offered the sensation of enjoying the natural beauty around. 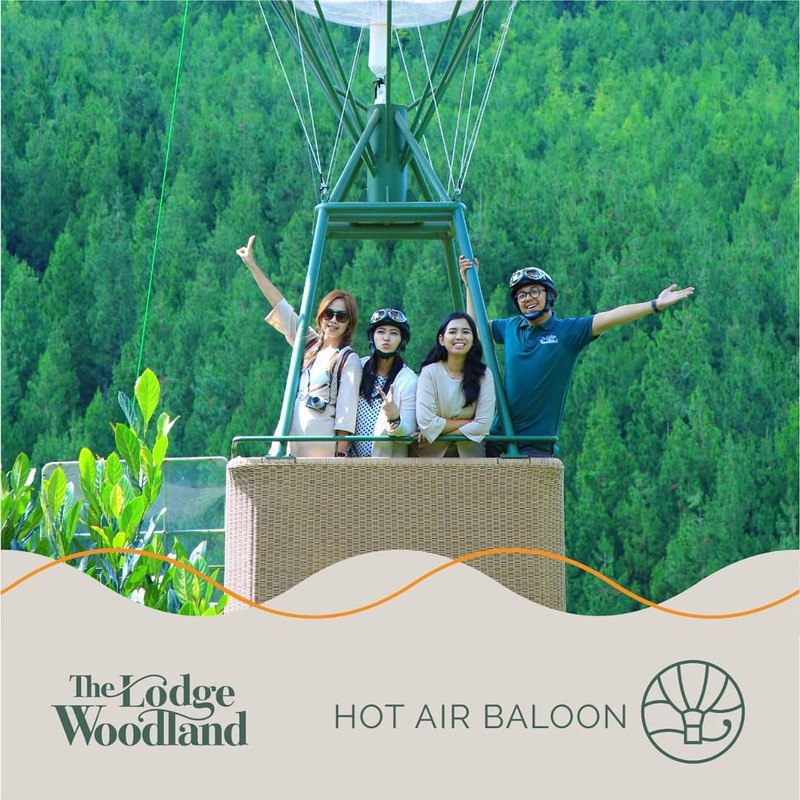 Hot Air Ballon The Lodge Maribaya's current ticket price is Rp.20.000, apart from the Lodge Entrance Ticket price you paid for. Gantole The Lodge MaribayaAfriend a traveler's, there are facilities or new rides that are also very challenging at The Lodge Maribaya, which is playing Gantole. It has been open since last June 2017, this place is now a hunt tourists who like this air sports activities. This place is now an alternative to other Gantole playground in Bandung that is Gantole Hill in Cililin. 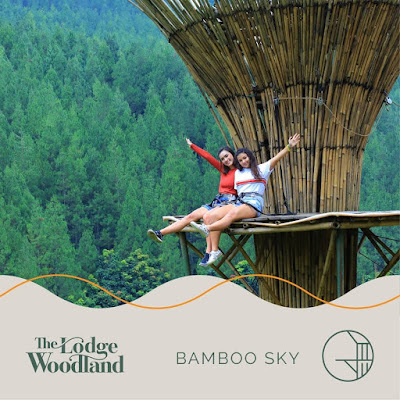 There is one more interesting rides that you can enjoy during the holidays at The Lodge Maribaya, the Bamboo Sky. From the name itself, you can imagine what kind of rides this is not it? 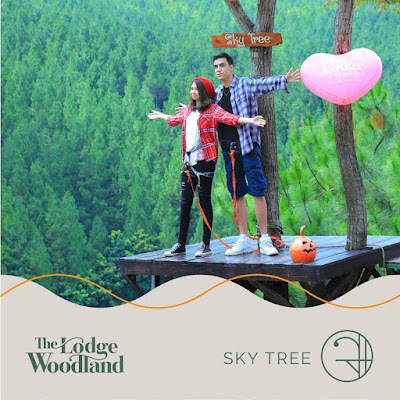 Sky Ticket Price The Lodge Maribaya is currently the same as other rides that is Rp.20.000. This swing rides is not an ordinary swing like the one in playground, but it will challenge your adrenaline.Yes feel the swinging sensation from above a rope like a swing, but with a remarkable height. Try you note the following picture, can you imagine not the excitement and the challenge?Well for visitors who are interested to try the game on Sky Wing rides this must pay a separate ticket.Ticket Price Sky Wing The Lodge Maribaya Lembang Bandung currently is Rp.20.000. Cafe The Lodge Maribaya Friend's traveler is not cool if visiting a tourist place in bandung, we do not try the typical menu of the place is not it? Well The Lodge offers a culinary sensation over a beautiful mountainous plateau and cool air in 2 culinary spots at once. The first is The Kitchen Restaurant which offers various traditional culinary menu typical of Rumah Makan Sunda in Bandung. The second is a The Pines Cafe that has been open since 2016, which offers a romantic cafe atmosphere in Bandung. The culinary menu price at Cafe & Resto The Lodge Maribaya was guaranteed very affordable. The operational time of The Lodge Maribaya in West Bandung is every Monday to Sunday, starting at 09.00 - 17.00 WIB. Friends of the traveler's, there are many ways to access the location of The Lodge Maribaya in Lembang, West Bandung regency. 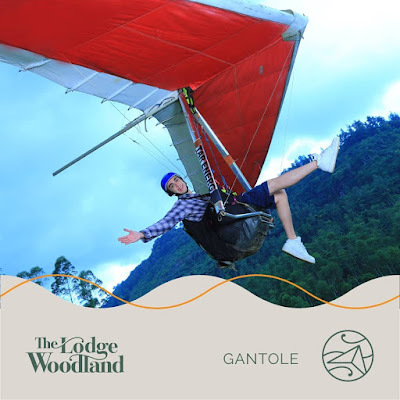 There are 3 road routes that you can pass to The Lodge, which is via Punclut, Jalan Dago Giri and Jalan Setiabudi bandung. For public transport, you can ride Angkot St Hall - Lembang route. Get off at the market, then take the angkot route Maribaya - Lembang.Then go down in front of the Gate, and walk to the entrance of The Lodge Maribaya.